It's been long, really long, that I've been thinking to start an event, and not disclosing the reasons behind my utter laziness, I feel ecstatic in announcing this one finally. Cook and post a recipe that falls in the category of 'Cakes, Cookies and Desserts' in your blog linking it to this announcement. It can be any kind of a cake, any variety of cookies or just any sweet/dessert that you have prepared. Only vegetarian entries invited, though eggs liberated just for baking. Multiple fresh and archived entries are welcome (as many as you can send! ), but linking back to this announcement and re-posting for archived ones is a must. After posting your recipe, just submit your entry to the linky tool provided at the bottom of this post. 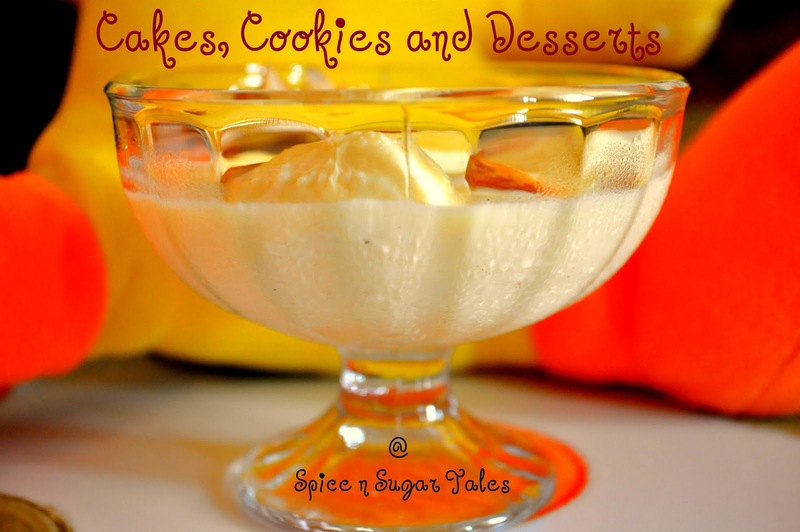 In case you have a problem linking, then send a mail to anjalishukla19feb@gmail.com with your name, blog name, recipe name and recipe url, with the subject line as 'Cakes, Cookies and Desserts'. Non-bloggers can also participate by simply mailing me their recipe with a beautiful click to the email id listed above. Don't forget to attach the recipe pic here. The event starts from Feb 10th, 2012 and ends on March 12th, 2012, so rush in and contribute for as many sweet memories as you can. Nice Event..apt for the season...Happy Hosting Dear! nice space...joined up..am your happy follower now....nice event..happy hosting. hi anjali...linked up one more!shall send you more entries...we're a family with a very sweet tooth! Do drop by my space sometime. Would love to hear from u.
great event Anjali..i want participate. I have lots of cakes and sweets and I linked to some of my latest. Hi Anjali, first time here, lovely blog, linked in my entry, Jigarthanda and following U.. Thanks for correcting my goof up.. I have no clue why I always thought your name was Anjana...Sorry again for the error. Lovely event and thanks for linking my cake. I am planning another cupcake for this Sunday, If I am in time in posting will link that also. Thank you Anjali for reminding me to link my post to the event page. Did that :) loved being part of the event, thanks for hosting !! "Chocolate cake with Strawberry Mousse"
Hi Anjali, Thank so much for your invitation for event. What a lovely event with amazing bakes. I've just link my entry.& thanks again for hosting. Have a lovely day! Hi Anjali, this is a Fabulous n Festive Event Dear.Happy to be part of it. Linked my entries. Happy hosting! Hi Anjali, Linked my entry for your lovely event. So many delicious desserts - not good when I'm trying to be healthy! Hi... Nice event.. Will send in my entries.. First time in your space.. Happy to follow.. I've just added a new post - Hamantach, which are special shortbread cookies filled with chocolate. I have just drop down one link..
Hi Anjali, linked two posts to your event but unfortunately something went wrong while uploading the Tiramisu pic. I hope you can correct it on my behalf, else let me know if you want me to do it. Good One Anjali. I am in! Amazing pictures ! I wish i wold have then on my portal.